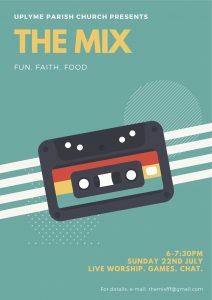 We are mixing up again for another youth celebration on 22nd July! Please join us, tell your friends and forward or display the poster. This service is aimed at teens but anyone who likes loud music and a bit of fun while exploring the Christian faith is welcome. This month the venue is Uplyme 6-7.30pm. Please publicise and pray for this event. We are also looking forward to the Mix in September, when Clive is kindly opening the doors of The Minster in Axminster.